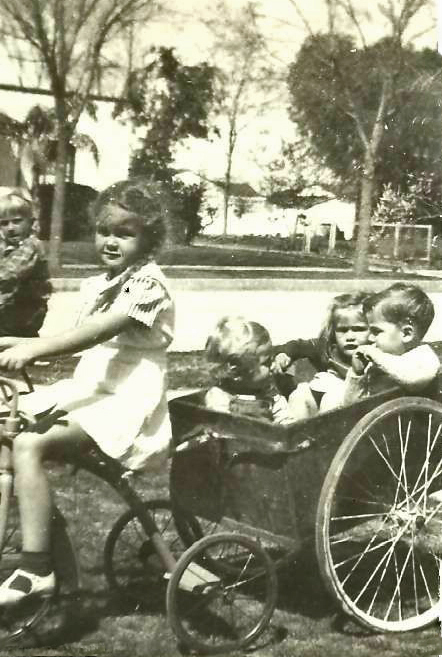 Marylin on Tricycle, Billy, Francine & Terry in Wagon, Johnny in Rear, No. Hollywood, California, 1944, vintage family photo, scan © 2012 by Marylin Schultz. All rights reserved. When nations form alliances on every continent, it means the lines are drawn and the winds of war sweep across the world, affecting all people, even small children. Two little girls in two very different families find they have been placed in opposite alliances, and this is their story. The year is 1941. Marylin Biggs was born in New Mexico. She is Caucasian and lives with her parents and older brother. Her mother is expecting a baby in January. On December 7th, America is drawn into the war which is now affecting the entire world. Her father, not wanting to leave his wife with such a young family, is given the choice to work for Lockheed, building war planes, which he accepts. In 1942, the Biggs family moves to California. In California’s central valley the Nakata family lives on a farm composed of beautiful orchards and vineyards. 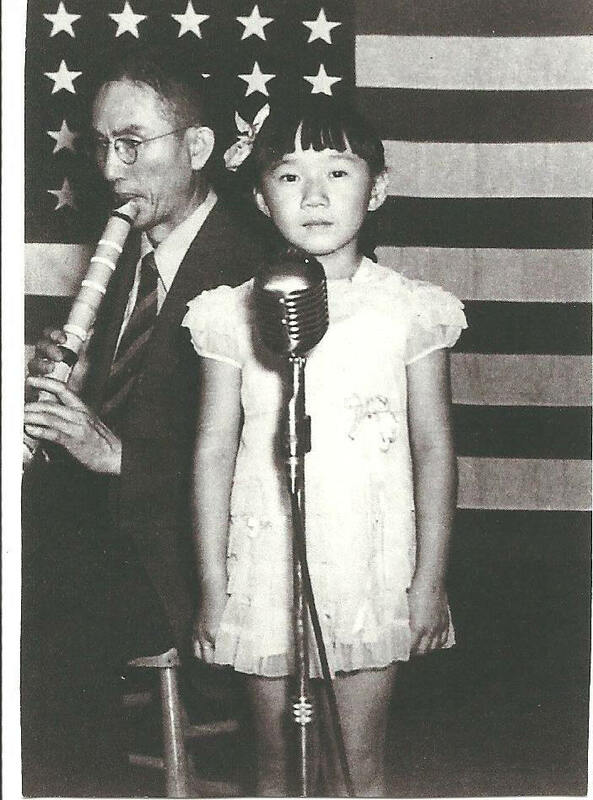 The children are 3rd generation Japanese Americans. Little Haruko enters Kindergarten in 1942. One day, out on the school playground, Haruko finds herself surrounded by 6th Grade girls. “Hold out your hand,” one of them commands. The small child meekly obeys, not knowing what to expect. The girl who spoke, grabs one of Haruko’s hands and begins to twist and twist a tiny finger until it breaks. Although the pain is excruciating, she is afraid to tell any adult at school and runs home. She never returns to that school. As it turns out, the Nakata family is also about to make a major move. The huge difference is that Haruko’s family does not have a choice. They are ordered off of their land and become internees in a Relocation Camp, far away. Marylin Biggs with her Cousin, Wiley Oliver, Glendale, California, 1942, vintage family photo, scan © 2012 by Marylin Schultz. All rights reserved. Marylin and her family settle down in North Hollywood, and her father drives to Burbank, the adjoining suburb of Los Angeles where he works at a Lockheed Aircraft Plant. The whole complex, including the large parking lot, is covered with a huge netting of camouflage. Russell Biggs rivets together the small, fast P-38 Fighter planes, which are designed to keep enemy planes from attacking the large, slower B-17’s, with their heavy cargo of bombs. His younger brother, Ralph, was a tail gunner on these Bombers. On his last mission, Ralph’s plane was shot down, but he was able to escape, parachuting safely into neutral Switzerland, where he spent the remainder of the war. That country’s policy was to treat all military personnel humanely, but not to release them until the war’s end. 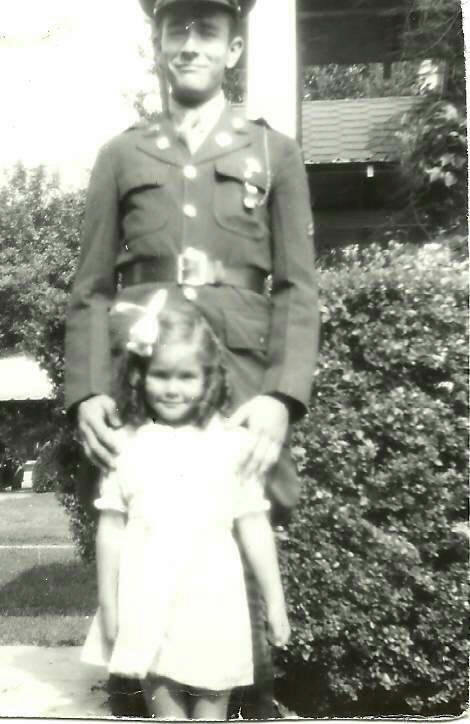 Wiley Oliver, a cousin of Marylin’s, made the Army his career, retiring with the rank of Colonel, many years later. Marylin also entered Kindergarten in 1942. She walked to school with her brother, Earl, who was in the 4th Grade. The children in the upper grades were given decks of cards that had the images of all the military airplanes on them. They were asked to become familiar with the appearances of the planes and to report any enemy planes that they might see. One day, on their way home from school, a small plane flew overhead and Earl shouted, “It’s a Messerschmitt; hit the dirt!” His little sister instantly obeyed, only to realize, at the sound of his laughter, that she had fallen for another of his practical jokes, and no danger was imminent! Life in wartime held anxious moments for a small child. The wail of air raid sirens meant grownups hurrying to cover windows. There were billboards that asked drivers, “Is this trip necessary?” This due to the shortage of gasoline and tires. Some foods were rationed, meat, sugar and butter. Marylin “helped” by putting the small packet of orange liquid in the bowl of white margarine, which made it look a little more like the butter it replaced. The family had a large “Victory” vegetable garden. But changes in the life of the Biggs family were insignificant compared to those for the Nakatas. Haruko and Marylin met while both were students at U.C. Berkeley. They lived in a large old home that had been sanctioned as a “dormitory.” It housed 30 girls. Marylin had never learned of the Relocation Camps before the two girls became friends. By 1942, Haruko’s family had lived in California for three generations. Their large farm was one of carefully tended orchards and vineyards that produced an abundance of fruit. The Nakata family, along with thousands of other Japanese Americans, were notified of their impending relocation. Each family’s baggage could not exceed 100 pounds. First, the “internees” were held in a gathering place, like cattle in a stockyard. Santa Anita Racetrack in southern California was one of these. The wait, at least a month long, was followed by a train trip into the interior of the country. Japanese American Internees at Heart Mountain Relocation Center, Wyoming, 1943, photo scan © 2012 by Marylin Schultz. All rights reserved. The Relocation Center, as it was officially named, consisted of rows of barracks, usually divided in half for two families. The whole camp was hastily built in only three months. Coming from a culture that embraces beauty, order, modesty and dignity, it was a shock to be given only one room for the entire family. Sheets were hung within each space for privacy. There was a coal burning stove for heat, but no furniture. The men gathered scraps of wood left by the carpenters, to make crude tables and chairs. Cooking was not allowed. The meals were prepared for them and eaten in barracks, or “mess halls.” They were unprepared for the bitterly cold winters. With quiet dignity they suffered the shame of living behind barbed wire with armed soldiers on watch. With about 10,000 internees, the Heart Mountain Relocation Center, or “Jap Camp,” as it was called by local residents, instantly became the third largest city in Wyoming. It was located between the towns of Cody and Powell. A school was established for the children, as well as a medical facility. Supervised shopping trips were allowed, and some of the men were hired by local farmers as field workers. There was a shortage of local men, most of whom had been drafted into military service. Incredibly, the younger Japanese men were asked to serve in the military, and many of them did. Some, though, were incensed by the irony of being imprisoned by their own nation and then asked to enlist. Those who chose to fight for their country did so, wishing to prove their loyalty. Most were in the same outfit, and it was the most highly decorated unit in World War II. Some of those who refused to enlist were actually sent to prison. Most of the local residents were not prejudiced against these citizens. Boy and Girl Scout troops joined in activities. In fact, former Senators Alan Simpson and Daniel Inouye first met and became friends as young men involved in Boy Scouts, before Inouye enlisted in the U.S. Army in 1943. When the war was over, the Nakata family returned to California, to learn that someone else “owned” their farm. There was no explanation or compensation given. They simply had to begin again, which they did. It was not easy, but the family prospered once again, and the children all graduated from college and led productive, successful lives. About Marylin: Marylin (aka oliverowl) is a freelance writer living in Wyoming. She has written essays for a weekly column in the Ventura Star Tribune and collaborated with her grandson on two picture books for children. She currently writes with the Cody Writers. Her previous pieces for red Ravine include the travel essay Rollin’ Easy, a Writing Practice, Kindness, and a memoir piece, Images From The Past. 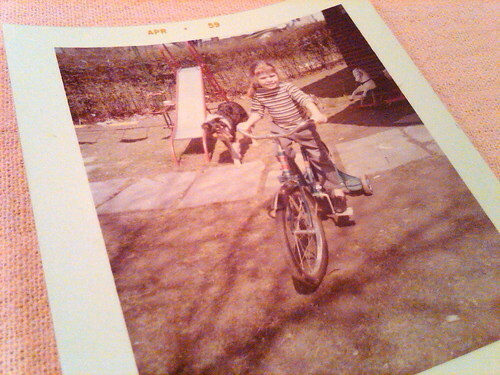 When I was eight, I received a new robin’s egg blue, girl’s bike for my birthday in May. I had selected that particular bike at the shop in the South End where we lived. I wanted a girl’s bicycle so I wouldn’t hurt myself every time I slid off the seat when I stopped. That always happened on boy’s bicycles and kept me from enjoying riding. At eight years old, I had already heard that one phrase, “I don’t think we can afford this much” so often that I knew I would never own the bike I wanted. That’s the way things worked in my family: you didn’t get what you couldn’t afford and we couldn’t afford much at all. I leapt out of my chair and grabbed the bike before it vanished. Only when I held the handlebars in my own hands was it real. I had the bike I wanted. Later that morning I opened the screen door and made sure to pull the bike out before the door slammed. I took it down all the stairs to the sidewalk and rolled it down the hill until I reached Ozark Street which was flat and graveled. Only then did I climb on my new bike and pedal along the street with the wind in my face. I felt so happy and so proud. My friends congregated up the street and I rode my new bike up there to visit with them and show them my birthday present. “No, you can’t. It’s brand new. I just got it and I want to ride it for awhile before anyone else does.” I held on tight to the handlebars. I turned around to ride home. The kids screamed names at me as I rode away. I’d reached the end of the block when a clunk sounded on my rear fender. A cheer went up from the kids. I crossed the intersection and started pushing the bicycle up the hill. When I was out of sight of my friends, I looked at the rear fender. Someone had thrown a big rock and dented and scraped a place on my new bike. I lost it. I couldn’t stop shaking and crying, but I pushed the bike up the hill, up the stairs and parked it on the porch. No, it was so much more than that. NOTE: WRITING TOPIC — MY FIRST BICYCLE is the latest Writing Topic on red Ravine. Frequent guest writer Bob Chrisman joined QuoinMonkey in doing a Writing Practice on the topic. My First Bicycle — Morristown, Tennessee, BlackBerry Shot of C-41 film print, Morristown, Tennessee, April 1959, photo © 2011 by QuoinMonkey. All rights reserved. Do you remember your first bicycle? Did you learn to ride a bike in the 40’s, 50’s, 60’s, or 70’s? Were you sporting a Schwinn, Raleigh, or Western Flyer, 24 or 26- inch frame, balloon-tired, single-speed coaster, three-speed, or ten-speed? Whenever I could, I’d steal away on my brother’s Schwinn Sting-Ray with the banana seat. Did your bike have a Wheelie-Bar (check out this cool poster for the WHAM-O Wheelie-Bar)? In the 1960’s and 70’s, bikes were booming. (Prior to the 1960’s, most bicycles were sold to children.) In 1960, 3.7 million bikes were sold in the U.S., with sales jumping to 15.2 million by 1973. When I took off the training wheels and graduated to a 26-inch frame, I’m pretty sure I was riding high on the Schwinn Fair Lady. Was my brother riding a Tiger? Did my sister have a Sting-Ray Stardust? I remember her bike had a white basket on the front, laced with flowers. Get out a fast writing pen and a spiral notebook and do an old-fashioned handwritten Writing Practice. Write My First Bicycle at the top of the page and 15 minutes, Go! My grandmother, who was Dutch, did an incredible job of spring cleaning, every March, every year she was alive. No object and no surface was spared a scrubbing. Rugs were taken out and beaten within an inch of their threaded lives; walls were washed with a hard brown scrub brush. Curtains taken down and washed. Every closet emptied, every sheet and towel bleached and washed. Everything dried outdoors on a clothesline. In March, Wisconsin is still cold so things froze out there, pillowcases transformed into wrinkled boards. Socks turned into twisted sculptures. She washed every dish and pot and spoon. Then when it was all done and everything set back in its proper place, she’d cover the sofa and chairs and lampshades in the living room with plastic covers. She’d lay a plastic path from doorway to living room couch and into the dining room. When I was around 11, I asked her, finally, who she was keeping everything so clean for and when would she remove the ugly plastic. (I didn’t say the word, ugly, I’m sure). “The plastic keeps everything ready for company,” she replied. “But, “I protested, “Aren’t I company?” I had never once seen her living room without plastic. “You,” she explained, “are family. Not company.” She didn’t need to add that I, being a rather messy child, was one of the reasons she protected her furniture. My mother didn’t do spring cleaning. She did like to open up all the windows on the first day the temperature rose over 50–to air everything out. I always loved that, coming home from school for lunch and finding the windows all wide open, the house looking like a toothless, eyeless caricature of itself, the air sweet and chilly. My mother hated being a housewife and did not cotton to cooking or cleaning. She did the minimums and stuck to the 50’s schedule that most of her friends observed: Monday clean and do laundry; Tuesday iron; Wednesday, volunteer work; Thursday, groceries; Friday, light cleaning (a lick and a promise, is what she called it); Saturday was the night my dad cooked burgers and Sundays we went to my grandparent’s house for dinner. My mother did what she felt she must but mostly without joy and often with many sighs. She did seem to enjoy ironing (which I so don’t get) and would sing while she ironed, in a voice like Ella Fitzgerald. Singing over the ironing and walking in the mountains – those are the times I remember my mother at her happiest. Not cleaning. Never spring cleaning. Well, it’s sort of spring now and I am sort of spring cleaning. I’ve been putting hours in every week to clean my attic. It has to be done. We’re selling the house and moving to the country. I’ve lived in this house for 28 years, married husband #2 after living alone here with my daughter for 5 years, moved that husband and his daughter in, had another baby, raised these kids until each one grew their feathers and flew off. Also raised a cockatiel, a parrot, four dogs and numerous gerbils and hamsters in this house. Can you imagine the debris? My attic had become a combination museum, closet (huge closet), and file cabinet. Treasures and cast-offs that have trickled down to me from three generations and two family lines. 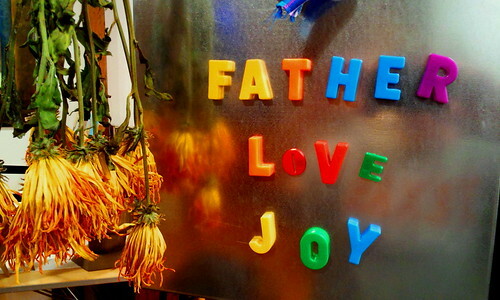 The leftover objects include outgrown clothes, games, books, and life directions. My very first poem, written at age 10. A couple of Jessie’s baby teeth, nestled inside the newborn bracelet she wore in the nursery: “Baby girl, Marks-Szedziewski, 2-19-78.” An envelope containing a curling wisp of very blond baby hair, Nic’s first haircut, 1988, a battered and faded pink pair of tiny toe shoes (mine, from 1955, I think; although they might be my aunt Jeanne’s). A hair curling iron (great-grandmother Nettie’s, late 1800’s). Aunt Jeanne’s bracelets from the 30’s. So glad I didn’t throw those away. Hundreds of notes from Jessie and from Nic: I Love You, Mommy. Mommy don’t tell anyone but I love you best. Thank you for being my mommy, You are the best Mommy, Next time you go on a trip, take me too. Mommy, I hate camp. Come and get me out of here, please!please!please! Nic’s version of Jingle Bells, written at age 4 with a few backwards letters, words scrawled across the page, Jingle Bells Jingle Bells Jingle all the way, Oh What Fun on Al’s True Ride, On the One on Holken Slay. Jessie’s school trophies, soccer and swimming, her camp and sports t-shirts, Nic’s academic medals for top scores in the state on the ACT and SAT at age 9 and 10, his IQ testing done at Northwestern U when he was 5. The way I wept when the tester called me and told me the test results. I wish I had known more back then how to feed his ravenous brain, his wonderful mind. So much I wish I could do over for him. I will be 63 in a month. The past is truly the past. There are no do-overs and no time left for holding on. Time, instead, for letting go. For boxing up, and throwing away, for going to UPS to send Jessie her soccer and swim team t-shirts, to send Nic his Pokemon card collection. Handing the keepsakes over to my grown-up kids, handing over to them the job of remembering. In the process of this sorting and cleaning, I’ve had to remind myself again and again to let go not only of the objects but the feelings. I’ve laughed, I’ve cried, I’ve longed to have my children back in my arms, on my lap, longed for one more night of reading in bed with Jessie at age 7, one more night of long conversation at bedtime with Nic when he was 10. One more chance to see each of them for one hour during each year of their growing-up – one more chance to drink in the sight of them, their wispy hair, freckled faces, braces and missing teeth, to listen to their piping little voices more intently, memorize each one of them even more completely. I had expected that cleaning out all this old stuff would help me clear the decks for this next chapter of my life, and yes, I guess that’s happening. I had anticipated reminiscing. I hadn’t anticipated the wave upon wave of memories to be so visceral, so wrenching, so expanding and swooping and full of love. I am not only clearing the decks; I am also rejuvenating both myself and the attic. Am going through some kind of death and resurrection here. Turning myself inside out and right side out again. Right side out and I must admit, a little trembly. Spring cleaning is a piece of cake compared to this. About Judith: Judith Ford is a psychotherapist and writer who lives in Milwaukee, Wisconsin. She was red Ravine’s very first guest writer, with the piece 25 Reasons I Write. Judith’s other pieces on red Ravine include lang•widge, Mystery E.R., I Write Because, and PRACTICE – Door – 20min. Spring Cleaning is based on a 15 minute Writing Practice on WRITING TOPIC — SPRING CLEANING. 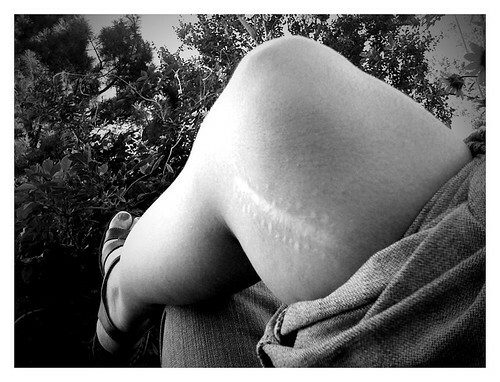 Centipede Dreams, scar from a benign tumor taken out when I was 12 (37 years ago), September 2010, photo © 2010 by ybonesy. All rights reserved. I had the tracheotomy at age 18 months after a croup turned to pneumonia. It was an emergency operation, part of my childhood mythology, the small Mexican doctor with wild hair who stabbed open a hole in my trachea so I could breathe. She had a frantic look in her eye, her hair loose and Bride-of-Frankenstein-like, and she held the sharp instrument up in the air before bringing it down to pierce my throat. In each telling I embellished the imagery. When my parents described the moment they decided to rush me to the hospital, how my lips had turned blue and I’d stopped breathing, my mind’s eye pictured the veins and blood from my body shimmering purple through translucent skin. Or when Mom and Dad said that my hair went from straight to curly “just like that” as I lay in the oxygen tent in ICU, I saw it happening as if in time lapse photography. Like the stockinged feet of the Wicked Witch of the West curling after Dorothy removes the ruby slippers, so went my hair, forming into tiny ringlets all over my head. It must be natural, I think, for a young kid to turn her childhood stories into morbid scenes, but what strikes me is how much staying power those scenes have. I don’t replace them with more reasonable pictures — a modest Mexican woman with hair pulled back in a bun, a ride on the gurney into a stark emergency room at the hospital. No, my scenes involve my parents bursting through a set of double doors, my limp blue body draped across Dad’s arms, them watching in horror as the doctor plunges a knife — or better, a pair of sharp scissors — into my throat. Or my parents watching in awe as my hair springs up in a bouquet of curl all around my head, like an angel’s. I don’t have such vivid imagery when it comes to the scar on my knee, although being that I got it at the impressionable age of 12, I did manage to fabricate a mythology around that one, too. I developed a crush on the orthopedic surgeon who did the procedure — my parents said he looked like a hippie, which made him all the more intriguing. In my mind, his golden hair flows out from under a light blue surgeon’s cap and he dons a small silver hoop in his ear. I clearly recall him coming to visit me after the operation, carrying the kind of Bell jar used for canning fruit. Inside is my white globular tumor floating in a yellowish brine. I’m surprised it isn’t perfectly round, like a golf ball. Kids looked at me with respect after that, but my story fell apart once they began asking all the questions that come with the idea of centipede-as-branding-iron. “What happened to the centipede?” “Well, it dried up and fell off,” I said one time, and then another time, “It dissolved right into the skin, see?, you can still see parts of it here.” Soon I became tired of the technicality of it all, I couldn’t keep the story straight and over time I left behind the centipede saga and kept only the image of my long-haired doctor. My latest epic scar involves two puncture wounds on the outer bridge of my nose, close to my eyes, that our rooster Lindo gave me when he tried blinding me with his spurs. Lindo and I shared a mutual animosity, he was a beautiful cocky bird who had such an intense hatred that the moment he spied me coming out the door he would strut my way with the intent to fight. I took to carrying a bundle of dried bamboo stalks, which I used to whack him as I made my way to whatever part of the yard I needed to go. He’d come after me again and again until my stalks splintered into pieces, at which point I took off at a full out run. Ultimately he got the better of me, one evening when I let down my guard. I had gone armed only with a bowl of compost into the bird pen. I bent down to throw a piece of lettuce to the bunny who lived there with the roosters, turkeys, and ducks, and Lindo saw his opening. He flew up at my face, spurs aimed at my eyes. He almost got them, too, and I’m not embellishing when I say that I traumatized my youngest daughter when I stood up screaming, blood streaming like tears down my cheeks. The strange thing is that no one notices the scars unless I point them out. One time, at a luncheon in China, I sat next to a German man who had the exact same two puncture wound scars near his eyes. All through lunch, I wanted to ask if he, too, had been attacked by a rooster. But I barely knew the man. I tried to imagine every other possible reason he might have carried scars identical to mine. Maybe he’d suffered terrible acne that resulted in two pimples near his eyes. Or perhaps as a teen he wore black leather and sported a purple Mohawk and a piece of bone pierced through the bridge of his nose. In the end, I couldn’t think of a way to broach the subject without embarrassing us both or drawing attention from the six other European men at the table. However, in my mind, I am certain that the very thing that happened to me also happened to him. Anything is possible. Postscript: This essay is based on a 15-minute Writing Practice in response to WRITING TOPIC – SCARS. The details that emerged from my Writing Practice were similar to other times when I’ve done timed writing that led to stories about my tracheotomy (specifically here and here) so I figured it was time to polish the narrative. Plus, since it contains important elements of my life story, especially my earliest years, I wanted to go with the energy, hoping it might turn into something I can weave later into memoir. Most people no longer recognize the patch I have in the center of my throat, down where my larynx meets my chest. It is a tracheotomy scar that must be getting lighter the longer I have it. When I was a kid, it was not uncommon for a perfect stranger would approach me in some store where I was buying sunflower seeds or Jolly Rancher apple sticks and ask, What happened there? I had the tracheotomy at age 18 months after a respiratory virus turned to pneumonia. It was an emergency operation, part of my childhood mythology, the small Mexican doctor with wild hair who stabbed open the hole in my trachea so I wouldn’t die. She had a frantic look in her eye, her hair loose and Bride-of-Frankenstein-like, and she held the sharp instrument up in the air before bringing it down to pierce my throat. That is the image that came out of those many times I heard my parents tell the story, it was the kind of story they would repeat to relatives and friends, even after we’d heard it for years, and in each telling I would embellish the imagery. Just like when they said that in the oxygen tent in the ICU, where I stayed for days afterward, my hair went from straight to curly, just like that and I can see it happening, in time lapse photography. Like the stocking feet of the Wicked Witch of the West curling and shrinking away under the house after Dorothy removes the ruby slippers, so goes my hair, forming into tiny ringlets all over my head. It must be natural, I think, for a young kid to turn their childhood stories into morbid scenes, but what strikes me is how much those scenes have stuck with me through the years. I don’t replace them with more reasonable pictures, a modest Mexican woman with hair pulled back in a bun, a ride on the gurney into a stark but clean emergency room at the hospital. No, my scenes involve my parents watching on in horror as they see the doctor plunge the knife into my throat, or watching in awe as my hair springs up in a bouquet of curl all around my head, like an angel’s. The scar on my knee came at an impressionable age, around 12 years old, and I fabricated a mythology around that one, too. I developed a huge crush on the orthopedic surgeon who did the procedure, my folks said he looked like a hippie, which made him all the more intriguing. Even though this seems unlikely, I clearly recall him coming to visit me after the operation, carrying the kind of Bell jar used for canning fruit, and inside was my white globular tumor floating in a yellowish liquid. The scar from that procedure resembles a centipede crawling on the inside of my right knee, and once after a real centipede zipped across my leg while I was playing hide-and-seek in the coat closet, I decided to tell any kid who asked me how I got the scar on my knee that it was left there by a centipede that burned itself into my skin. That’s how centipedes bite, I told them, they sear themselves right into you. Kids looked at me with respect after that, but my story fell apart once they began to ask all the questions that came with the idea of centipede-as-branding-iron. What happened to the centipede itself? It dried up and fell off, I said one time, and then another time, It dissolved right into the skin, see, you can still see parts of it here. Soon I became tired of the technicality of it all, I couldn’t keep the story going and over time I left behind the centipede and kept only the image of my long-haired doctor. I have two puncture wounds on the outer bridge of my nose, close to my eyes, that our rooster Lindo gave me when he tried blinding me with his spurs. One time, at a luncheon in China, I sat next to a German man who had the exact same two puncture wounds near his eyes. All through lunch, I kept wanting to ask him if he, too, had been attacked by a rooster, but I couldn’t think of a way to broach the subject without coming off sounding like a whacked out American. Now, in my mind, I am certain that the same thing that happened to me happened to him. Anything is possible. NOTE: Scars is a Writing Topic on red Ravine. Guest writer Louis Robertson was inspired to join QuoinMonkey and ybonesy in doing a Writing Practice on the topic.